It's Kelly from kamscraftyplace.blogspot.com. Thank you Pam for having me back again as a designer. As you know the cart of the month is Just Because Cards. This is a great cart, but I wanted to do something a little different. I love making my own flowers. It's a bit of an addiction. On this cart there is a sun and I thought this would make a great flower. 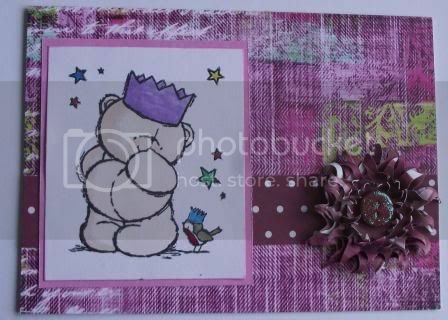 I used double sided card from Papermania, paper from Dovecraft pack called funky vintage and a forever friends stamp. I choose the sun which is layer one. I used the hide contour button to hide the splits on the sun. 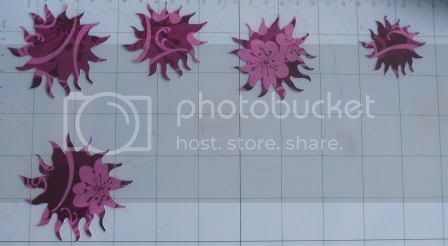 I used 5 different sizes for the sun. You can see this on the Gypsy screen below. Here are the sun's cut out on the mat. I had the blade on 4 and pressure was medium. I cut them once, but if you use quite thick card I would cut them more than once. 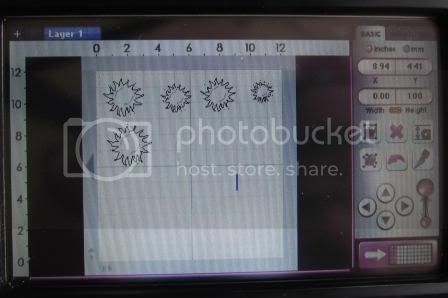 Here is a overview of the flowers with some already curled. To curl them I used the end of a paint brush. I curled it round then squished it slightly. The two next pictures show different ways to curl the rays of the sun. On the smaller flowers I did snip it a little bit toward the centre with my sissors, so that I could curl them even more. Here they are assembled. To finish them off, I squished them a bit more. Being card they will hold their shape more. 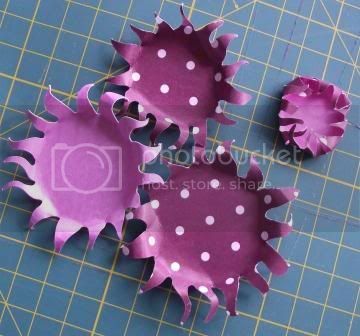 I used buttons with some stickles for the centres and some sticky gems. You could use brads etc. As you can see the flowers are quite quick to do. They don't take long to curl. You can use different sizes depending on your project. Some of the flowers had 5 layers and some had 4. I hope you liked my project and will look at you carts more closely to see what designs could be used for a different purposes. WOWSERS those flowers are AWESOME! I love the finished look and with your great tutorial they should be easy to make! TFS. Cute, cute, cute. Love this one. Looks like it will be easy to do. TFS. Love flowers too. This is fabulous! Thanks for sharing. Oh so cute. Excellent choice in paper and stamps. How awesome is the flower!!! Love the flower thanks for the tutorial. Thanks for the super idea. Your flowers are awesome! Great idea for flowers! 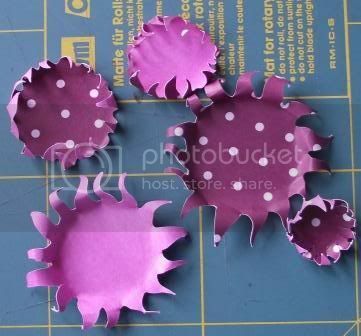 I haven't made any 3D flowers yet, but you make it look so easy that I'll definitely have to try. I love these!!! Thank you! 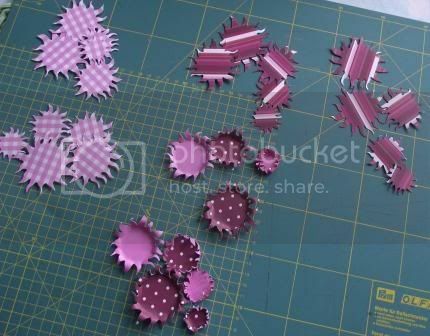 I'm putting this flower tutorial link on my list of flower tutorials on my blog so I can come back over and over! I love making handmade flowers as well. These are gorgeous. Thanks for sharing with us!! Cute card - and I love how you made the flower. I have this cartridge and didn't even know there was a sun on it. Thanks for sharing your tutorial with us! 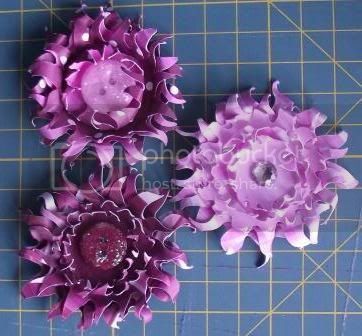 Wonderful idea on how to make flowers. Thank you!